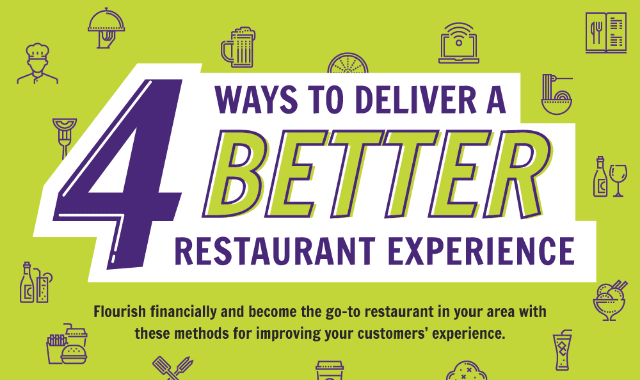 4 Ways To Deliver A Better Restaurant Experience #Infographic ~ Visualistan '+g+"
Restaurants are reaping the benefits of growing interest in cooking and food shows on television, as well as the foodie revolution. Along with the increased business, their diners are now savvier and more sophisticated than ever before. Indie dining establishments, as well as restaurant chains, have embraced high-tech tools to improve service and upgrade their customers’ dining experience. Regardless of what your brand image and target market are, this infographic illustrates that going digital yields some series benefits in terms on more traffic and repeat business. Faster seating has always been a challenge, but some establishments are finding ways to making use of the wait time. Table side devices provide unparalleled functionality for ordering and payment, allowing serving staff to deliver more personalized interactions with their customers. Additionally, these units also offer games and trivia apps that can draw in diners on slow nights. Digitally-managed loyalty programs encourage return business, and quick access to electronic customer feedback offers instant information on how to improve service and quality. This infographic from Buzztime hones in on those vital ingredients for a great experience by incorporating restaurant tablets, trivia, reduced wait times and more that will make your food haven the talk of the town!